Greetings! 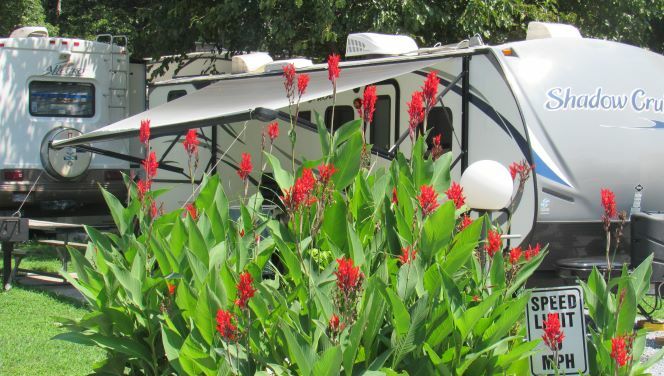 Tonia here to share a little bit about Holly Shores famous flowers – If you’ve ever camped at Holly Shores, then I’m sure you’ve seen the beautiful, tall, red flowers growing everywhere! 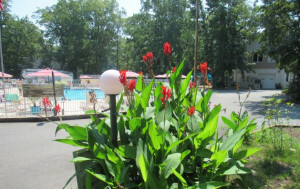 These plants are called “Canna Lilies”. 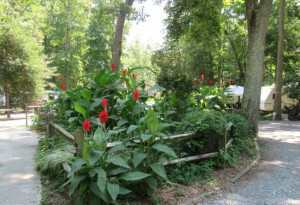 Cannas go by many names around the world but are native to South America and other warm climate regions. 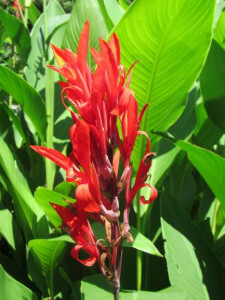 Their scientific name is, “Canna Indica” (guess you learn something new every day huh?). Well I’m about to teach you a bit about what goes into caring for these plants here in New Jersey, more specifically here at Holly Shores. First a bit of personal history about them: Maggy and Dave started off with 2 buckets full that she got from a farmer in Cape May Court House, NJ. Now we have roughly 20,000+ and have them spread from A1 Easy Self Storage, to the Cape May Distillery. Maggy has given over 5,000 bulbs away to her sister’s campground, Beachcomber, and to friends from Rhode Island to Florida! 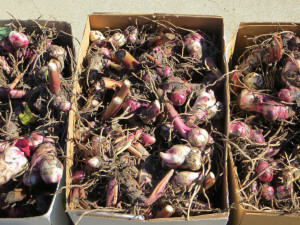 Every year around the end of November (usually after the first frost) the plants are trimmed down to the bulb and dug up. Sounds easy enough, right? As a member of multiple teams here at Holly Shores, I can tell you it’s back-breaking and extremely time consuming! I’m not complaining though because it’s worth it to be able to watch them grow every year. We start by using the map from the spring that tells us where the plants are located. 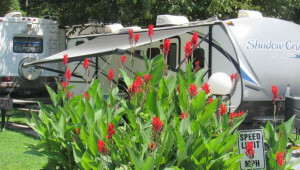 Keep in mind that our campground is anything but small and the plants also multiply throughout the season! We load a golf cart or two up with shovels, barrels, gloves, and handheld clippers. We trim and dig each bulb out by hand, shake the dirt off and toss it into the barrel. Again, sounds easy right? Well weather permitting we don’t always dig. You don’t want to be digging these monsters out in the mud! The bulbs are anywhere from 1 inch to over a foot long! This process takes 2-3 weeks. The bulbs are stored in a climate-controlled area where, yup you guessed it, they continue to multiply! When spring time rolls around we have tons more bulbs to plant. In April when the weather starts to warm up a bit, we begin the process of planting, but not before Maggy, Dave and Brian decide where they’d like to see them grow. We try to plant them where the sun is abundant, and the soil is rich. We add good top soil to the places that are lacking. One by one the bulbs are planted three to four inches under the surface. In about two weeks we start to see their bright green shoots poking through the soil, and before we know it, they’re taller than you or me! Cannas grow between 4 and 6 feet, so science says but I’ve seen taller! Guess that just means we rock at taking care of them! Maggy often jokes that when she and Dave pass away, maybe people will think of them while enjoying the beautiful flowers and watching the humming birds – yes, they attract them as well! Just as we hope Maggy and Dave live forever, we hope you’ll enjoy this beautiful attribute to our park and appreciate the work and care that goes into them as well as the rest of the park. See you soon Happy Campers! !